Apart from all of the other problems posed by the rush to ban petrol and diesel cars, there is one very big one that should really concern us all. The fact that China is moving rapidly to control most of the world’s cobalt supply. 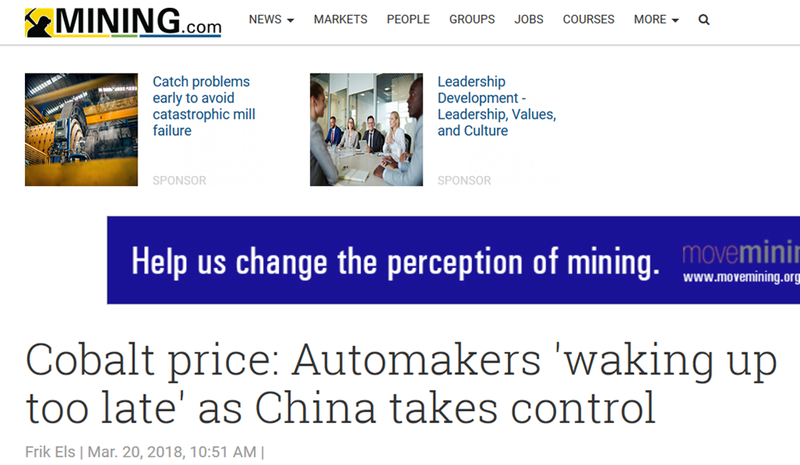 The auto industry is "waking up too late" to the fact that China will hold most of the world’s supply of battery raw material cobalt, Ivan Glasenberg, CEO of top producer of the metal Glencore, said on Tuesday according to a Reuters report. "If cobalt falls into the hands of the Chinese, yeah you won’t see EVs being produced in Europe etc. They are waking up too late … I think it’s because the car industry has never had a supply chain problem before," Glasenberg told the FT Commodities Global Summit in Lausanne, Switzerland. If China controlled 80% of the world’s oil supply, I suggest we would all be very concerned. Yet governments here and in Europe are falling over themselves to ban technology that works, thus throwing our car industry to the wolves, and instead place the transport systems, upon which our economies are so dependent, at the whims of the Chinese government. Cobalt prices have already rocketed in the last couple of years, and last month the Democratic Republic of Congo announced it would impose a 10 percent royalty tax on cobalt producers. Other sources of cobalt may, of course, be developed over the time, and other metals may help to reduce the dependence on cobalt in batteries. But these are all ifs and maybes. It seems to me to be suicidal for our government to be leading us down this blind alley, having burned our bridges behind us. Still, at least we no longer need to fight physical battles to lose wars. Oh well, EVs are crap, expensive, will have no secondhand value and there’ll be no lekky to charge ’em anyway. Perhaps the greens can knit some batteries from organic Llama wool. Least you’ll have soft socks to walk to the darkened shops. Maybe the battery recycling industry in the UK needs to get into gear and recover the cobalt, etc, from scrapped batteries of which there will eventually be rather a lot! China is following similar tactics with key resources for wind turbines (neodymium for the lightweight high powered magnets needed for tower top generators) and solar panels. The smart thing to do is to let them get committed, and then abandon green policy, leaving the Chinese with the investment cost and no market. The smart follow-up is to work on technology of the future without unnecessary green constraints. None of that is to argue for dropping sensible levels of pollution control. Just keep making diesel and petrol cars. Oh, I so agree. Just bought a new diesel and I know it will outlast any piece of EV crap. Haven’t got to worry about battery recycling either. Except our lunatic politicians have ensured we can’t do this by passing the Climate Change Act and establishing the Committe on Climate Change as an ‘independent’ enforcer. notrickszone highlighted this recently from the German news media. Don’t expect our Government muppets to know what is happening through. They are too busy taking their instructions from the Green NGO’s. Couple of other worthwhile reads recently. There is a town in Northern Ontario Canada named Cobalt which had several silver mines near it. Included in the waste (tailings) was cobalt The price has risen four-fold to US$90,000 per ton from US$22,000 per ton in 2016. Also Apple Inc. — which is developing an autonomous driving system — is in direct talks with a mining company to secure its own cobalt supply. The world goes from competing for one of the planets most prolific mined products, coal, to one of the planets rarest mined products. Is this insane, or is it just me? Ford’s stock took a tumble that made many people aware of the Periodic Table. Firms like Apple and BMW know they can pass on the increasingly high cost of cobalt to their mostly well-off customers, who expect to pay high prices anyway. But it looks as if the mass market is going to have to find another way, sooner or later. Decades ago, it was common to see photos of Beijing “traffic” made up of thousands of bicycles. For much of the life of the former Soviet Union, an internal passport was required to travel within the USSR. These illustrate control of people’s movements. Basically both were methods of successfully trapping populations in restricted areas without freedom of movement.. “Serfdom” by another name, if you will. This article, along with the recent one here on the move to “ban hybrids,” shows the seeds of the same mentality. Converting everyone to a mode of transportation such as being proposed provides an extremely effective choke-point for those with dictatorial aspirations. I have already sensed from following this blog for a number of years, that those in power of the UK are basically immune to the public wishes. As they listen only to themselves and ignore other opinions or indeed even “see” the plight of less fortunate citizens, it leaves a large void between them and reality. Once you have restricted movements of the population via the electric cars with limited mileage between charges, few charging stations, and intermittent electricity production, you are halfway there. Then, with the same unreliable, inconsistent electricity production and everyone with “smart” apparatuses, it will be extremely easy to hold you hostage to anything they wish. If you choose not to comply, you lose your electricity, etc. Instead of seeing this as only the lack of reality on the part of the power brokers, I would also consider a more sinister intent. Thank you Joan. I always enjoy reading your contributions. How I wish that you were our ‘Minister of State at the Department for Business, Energy and Industrial Strategy’. The current incumbent is a total disaster. Thank you for the kind words. I think I will stick around here as we are finally getting out from under those folks with the election of Donald John Trump. I watched the Houston,Texas rally last evening on my laptop. There were more than 100,000 requests for tickets. People were camped out for more than a day to get in. They had changed to larger venues twice. Senator Cruz said it held 16,000, but I would judge more as our WVU Coliseum holds almost 15,000 and this looked quite a bit larger. Outside, thousands who could not get in stayed and watched it on huge Jumbotrons. I went to the Wheeling, WV rally on Sept. 29 as a volunteer (better seat and no waiting in line). You could not have gotten a sardine in sideways–ca. 16,000. These are raucous, happy parties. It is fun to be an American again. As a bonus, we get to watch the left in absolute meltdown. For a fast recharge time – important if they are ever going to convince people to get one – you need cobalt and will do for the foreseeable future. I happened across James May’s car of the people series late the other night and he said that in the real world the true range of a Nissan leaf is 75 miles – which is the same as the first electric car back around 1900, and one of the reasons the ICE took hold. Steam was the other option. And in your normal car today of the handful of things that are unchanged, there is the battery.